There’s no telling why 21-year-old Timothy Williamson chose an overpass at the base of Capitol Hill to end his life last Saturday night. But the leap of between 28.03 and 31.11 feet from the Pine overpass — it varies across the lanes of I-5 below — is not something the human body is designed to withstand. Today, there is nothing preventing somebody from doing it again. The Washington Department of Transportation tells CHS that it has no plans to install barriers to prevent jumping from the three main overpasses near the Hill — Pike, Pine and Denny. The agency says it does not track suicide attempts and has no statistics on how many people have jumped from the bridges connecting Capitol Hill to downtown. CHS has reported on three jumping deaths involving the overpasses since September. This man in his 60s died on the afternoon of September 1st. This man in his 30s died in October. Williamson died just before midnight on Saturday. While many point to this study that showed no effect on citywide suicide rates after a barrier was installed on the Bloor Street Viaduct in Toronto, other research shows that the structures can, at least, make a local difference. The Seattle Department of Transportation also says it does not track suicide statistics and that the overpasses are state turf. “The overpasses on I-5 are owned by WSDOT, and any decision to add barriers to discourage jumping from the overpasses would lie with them,” a SDOT statement sent to CHS read. The $4.6 million project to install barriers on the Aurora Bridge was completed last February 15th. It ringed the structure in an eight-foot, nine-inch fence designed to put an end to the bridge’s long history of Seattle suicides. A WSDOT spokesperson said that, if barriers are to be added to any overpasses in the city, Olympia is going to again need to be involved. Like the Aurora Bridge barrier, barriers on the Capitol Hill overpasses would need to be driven forward by the legislature. The WSDOT rep said lawmakers finally took up the bridge issue when software company Adobe and other neighbors complained to representatives about the suicides as a psychological issue for those who had to experience the aftermath. we all know it’s less of a psychological issue to have somebody land on your windshield or on the road in front of you than it is to see them land in the ship canal from the office window. Really… with so many suicides in such a short period of time as reported here, it seems to me like more people are jumping from the Pike/Pine overpass than Aurora ever had. am I the only one bothered by the fact the state put a fence up to try and prevent tagging on their sign but they can’t be bothered to put one up to keep folks from jumping to their untimely demise? Human body wasn’t “designed” to do anything. It simply does or doesn’t. 1) The first study shows that the rate of bridge-jumping suicides in Toronto was not changed by the suicide-proofing of one bridge: lots of data, very significant result. 2) The second study showed only 6% of people who’d been prevented from jumping off the Golden Gate Bridge went on to kill themselves. It makes the news because it’s the only one we can do anything about, and the one most likely to affect bystanders. Gunshots, overdoses and hangings are the top 3. Since jumping from the Aurora Bridge is now not possible, or at least much more difficult, I wonder if those who would have used that location in the past are now choosing other places, such as the overpasses. This would explain the apparent increase at the Pike/Pine location. I believe many of the jumpers would land on the ground or on roofs to the north or south of the ship canal. That was a big reason why the Aurora Bridge got the barrier. Humans have been finding ways to kill themselves throughout recorded history. A fence will not stop a suicidal person from carrying out their plan. Stop wasting money on fences. Put the fences up to protect the drivers and passengers in the vehicles below. No, you can’t stop people from killing themselves, but you can stop them from ruining someone else’s life. If someone came crashing down onto the hood of your car, don’t you think you’d have nightmares for years, or even the rest of your life? I would. That’s not fair to the unsuspecting driver. Protect them, even if you can’t prevent the suicide. Alternatively, we can simply move our entire society underground and live as mole-people. Same result. I’m more worried about the hood of my car than protecting someone who doesn’t want to be here. That’s a great idea. Then, when someone wanted to kill themselves, they’d just bury themself. Then when they were dead, nobody would have to clean up after them. Exactly! Suicide prevention is a noble enterprise, but the safety of people on the highway is WSDOT’s primary concern. That seems reason enough to erect barriers. The 60 year old fellow jumped and was hit by the car next to mine in the right center lane of I5. I witnessed it, I stopped, I watched the officer put the blanket overy him and direct traffic around. I’m doing ok with it. I was sad about it for a few days, but no nightmares really. I do think some humans would be freaked by it though. I agree we should protect drivers from suicidals, but why this instead of coming uip with fences that stop drunk drivers from entering freeways if we really want to talk about controlling what we can control? There are suicidal moles so moving underground may not help. Yes, that’s really the goal. I used to live on north Queen Anne and the Aurora bridge span covers mostly land and roads. A few years ago, someone had jumped and landed on Westlake Ave – obviously not a pretty sight, but more importantly, incredibly dangerous to anyone below. No need for collateral damage by someone who obviously doesn’t care what happens. Build barriers at Pike and Pine and people will go to Madison Street. But hey, it’s no longer Capitol Hill’s problem, is it? Those barriers definitely won’t reduce the number of suicides – somebody who wants to kill him/herself will find a way to do that. I just wish that those who want to end their lives won’t interfere with the lives of innocent people – in this case drivers on I-5. Fences can help to prevent other lives from ruining them. You are one of those people who didnt learn what responsibility means. Whose problem is it really that somebody wants to take their life? Just saying, the real problem won’t go away if they put up the barriers. There are plenty of other places along the freeway if Pike and Pine aren’t available. Barraging all of the overpasses in Seattle will get costly. Seattle: 11 suicides / 100,000. Population 600,000: so ~ 66 suicides / year in Seattle ( http://www.b-sustainable.org/personal-environment/suicide-ra). Statistically we’ll probably never know if the potential Aurora Bridge suicides no longer happen or if they jump elsewhere or choose some other method. 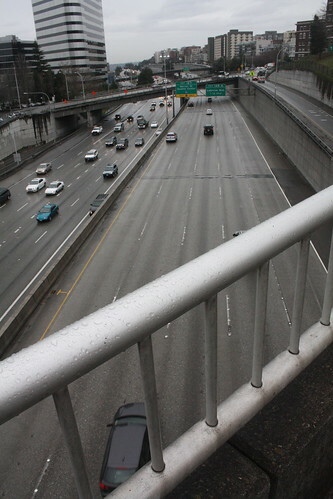 3 jumping deaths on I-5 overpasses since September is of the right magnitude to be “displaced” Aurora Bridge suicides. Anyone want to dig into the records to see what the historical rate of I-5 overpass suicides is? WSDOT may not want to add barriers to I-5 overpasses, but it appears that they should be easier and hence cheaper to implement that the Aurora Bridge one. The Aurora Bridge barrier addressed the suicides and the distress of bystanders (I never heard of others being killed) but the I-5 ones would surely address the very real possibility of injury or death to motorists on I-5. Actually nearly all suicides are impulsive actions and yes you can in fact stop someone from killing themself. Although there was a recent suicide on the Aurora bridge (on a recent Saturday at about 11 am) it has dramatically cut the rates of jumpers. I am surprised by how many people seem to repeat myths like this – death by suicide is an outcome of an untreated mental health problem and in nearly all cases is preventable. There are also national standards for reporting to prevent “contagion” but once a bridge or location gets a reputation it tends to draw more people to it. I had a teacher that killed herself by jumping off The Aurora Bridge, and tragic as this was I don’t think spending millions on suicide fences is the answer. I think the money would be better spent going back into the states depleted mental health programs to help these people, rather than trying to police where and how they choose to end their lives.